Stainless steel Rotomite-180P dredges lined pond at zinc mine. SRS Crisafulli. Crisafulli Rotomite 180-P dredging red mud. Customer: Zinc mining & processing facility, South Korea. Problem: How to remove 200,000 cubic meters of 325 mesh goethite (pH 2.2 - 2.5 range; sulfuric acid) from a lined pond with dimensions of 120m x 253m. Since the material had settled and was resting on the pond bottom, dredging was selected as the appropriate removal method. 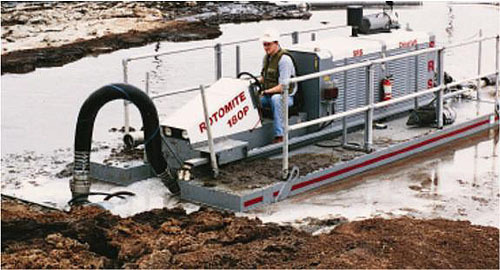 No standard acid-resistant dredge was in production which would enable the client to consistently feed a dewatering process down-line from the pond. Solution: Crisafulli was selected based on Crisafulli's ability to design and manufacture for specialized applications, and experience in aggressive dredging environments, including caustic, corrosive and abrasive sites. The Crisafulli 180-P Rotomite Dredge was selected as the dredge of choice, capable of removing the customer's settled solids at a rate of 50 - 80 cubic meters/hour. The dredge's hull and all wetted parts were fabricated of stainless steel to deal with extremely corrosive environment in which it would work. High-grade acid resistant coatings were applied to all components above-deck which might be subject to incidental contact with the low pH material. The dredge's cutterhead was fitted with a protection system to prevent accidental penetration of the pond's liner.